Canadian 1 Ounce Palladium Maple Leaf Coin - set of 20 coins. Each Canadian 1 Ounce Palladium Maple Leaf Coin is produced by the Royal Canadian Mint, and contains 99.95% pure palladium. The Canadian Mint is only one of a couple of mints that produce palladium bullion coins. 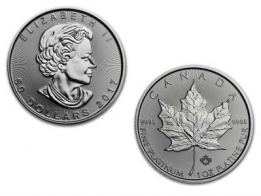 The Canadian Palladium Maple Leaf features an image of Queen Elizabeth II on the front. The face value of $50 CAD is at the bottom and the year of minting is on the right. The reverse of the coin features an image of a Canadian Maple Leaf, and includes the size, weight, fineness and metal content of the coin. The Royal Canadian Mint also produces the famous Canadian Maple Leafs in gold, silver and platinum. 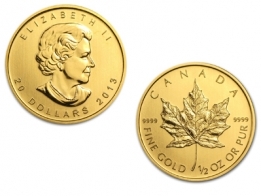 Wholesale palladium Maple Leaf coins come either as sealed plastic sheets of coins or in a plastic tube. 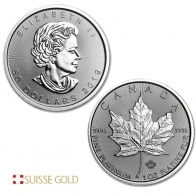 The palladium Maple Leaf coin is currently only available in 1 Ounce denomination. To view the current palladium price, please click here. Price includes free insured storage in our vault for up to one year from purchase date.